There are many ways to improve the performance of your marketing campaigns. As marketers we need to be able to pinpoint problem areas in the funnel and come up with solutions for improvement. We learn and iterate. At the start of a campaign, for example, we need to get as much targeted traffic into the funnel as possible. Then we must convert a portion of the traffic into qualified leads. But what if the traffic isn't converting? What if people are engaging with the campaign but then fall off at the end? Take a step back for a moment. Why would people respond to your messaging, click, read but then refuse your offer? Because they don't want what you're offering! As a lead gen focused company, we've seen our fair share of perfectly executed campaigns supported by piss poor lead magnets. Well enough is enough. It's time every organization offered lead magnets their audience actually wants. In this article I want to share 9 lead magnet ideas and examples. These are lead magnets we've seen perform best for clients. I want to spark your imagination and give you lead magnet ideas your audience will actually want to convert on. Throw your boring white paper into the trash and let's get started. A lead magnet is the bait you offer to your leads in order to get them to convert on your form and become a lead. It can as simple as an article converted into a PDF, or as extensive as an ebook, industry report or infographic. Whatever it is though, it always serves the same purpose: to be used in exchange for contact information. How do I know what type of lead magnet is right for my business? It’s generally recommended to keep your lead magnet as focused as possible. Stick to one subject and refine it based on your ideal customer. Keep in mind who they are, what are they looking to achieve, and how you can help them get there. For example, a golf academy might give away a free 5-point guide to improving your golf swing. A real estate agent might give away a free checklist for buying a new home. Whatever your lead magnet, remember that it must be tied to your product or service. This way you can ensure the people who download it are actually interested in your business (i.e., no steakhouse gift cards... unless you are a steakhouse). Let's get into the lead magnet ideas and examples. Online courses are more popular than ever. Take an inventory of your most popular blog posts and content pieces and use them as a base to determine what your users want to learn about. Often the only equipment that will be required is a simple screen recording software such as Quicktime and a basic microphone. 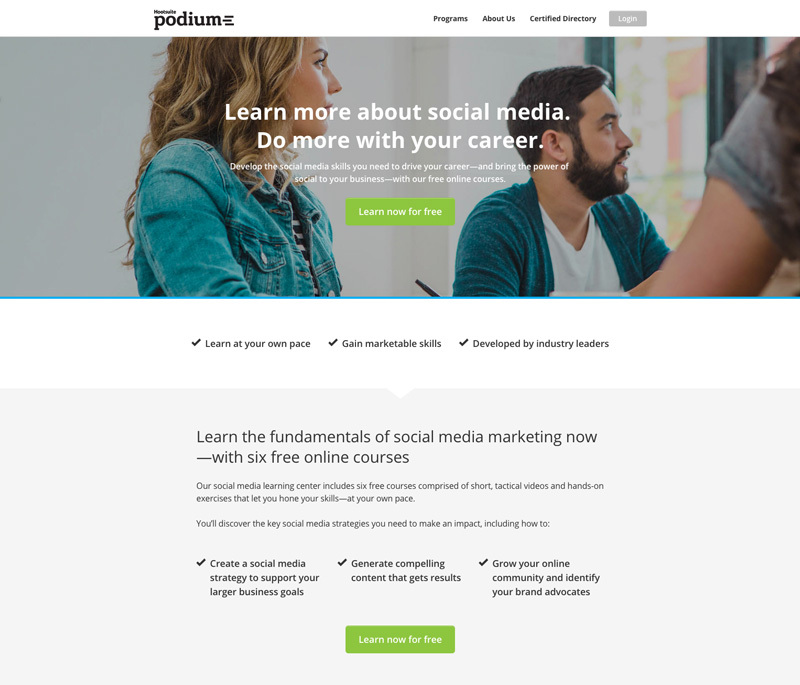 This is a landing page from Hootsuite promoting six of their social media marketing courses. Hootsuite knows that anyone interested in learning the fundamentals of social media marketing would also have a need for a social media management tool. By providing free courses on social media marketing Hootsuite is able to educate their leads as to the value of their services while at the same time building trust and rapport. For a look at Wishpond’s own online, free marketing courses, check out Wishpond Academy. 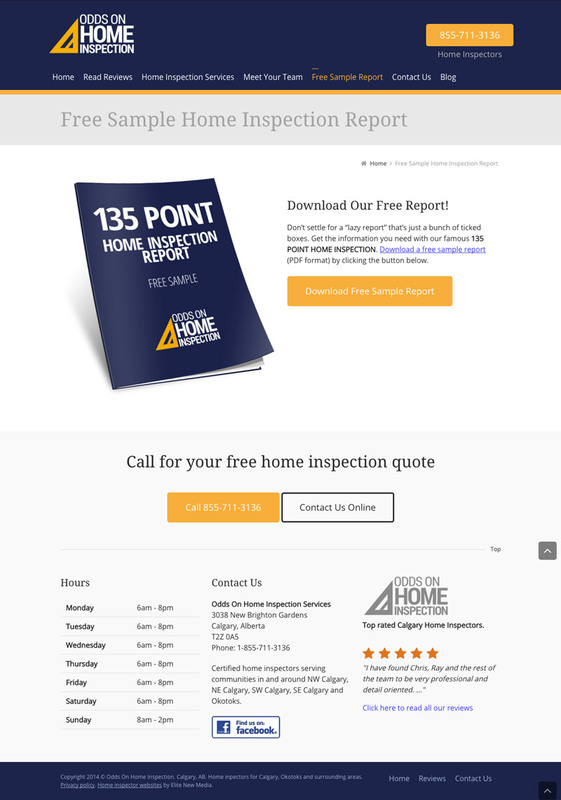 Odds on Home Inspection provides a free home inspection report to people interested in buying a new home. While some users will use the report to conduct their own inspection, others will realize how extensive the inspections are and will likely seek out professional help. When they do, who do you think they’ll call? A checklist is used to simplify a blogpost or article into bite sized manageable steps to help users get started. Checklists are a great way of condensing broad topics into something actionable. 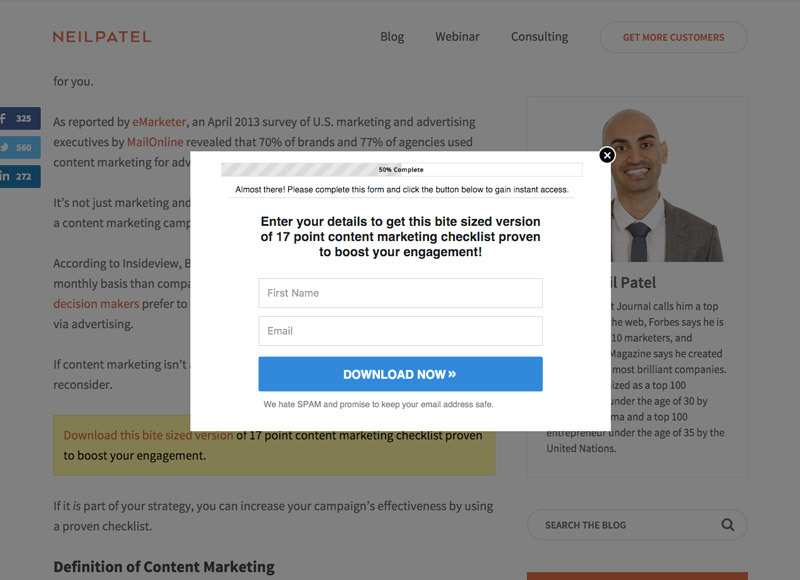 Online marketer Neil Patel uses this strategy on some of his blog posts to give his readers something practical to take away after consuming his content. 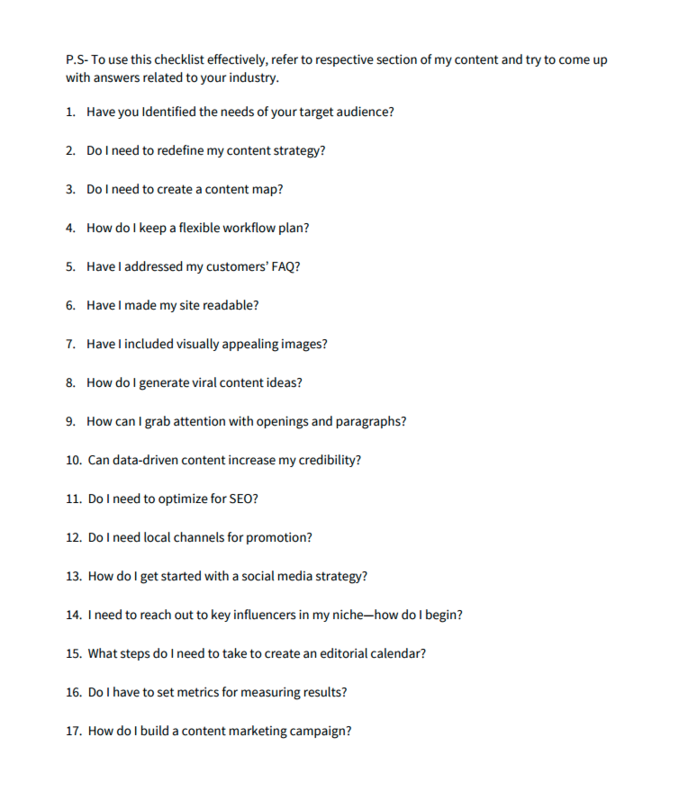 Checklists are one of the easiest lead magnets to create. The lead magnet in this example was just 17 short questions all taken from his article. When creating checklists consider taking the main topic of your blog post or article and summarizing your key points or headlines into simple questions for your users. For more on how you can create checklists (and other content upgrades), check out 7 Content Upgrade Ideas and Examples that Helped Build 100k Subscriber Lists”. 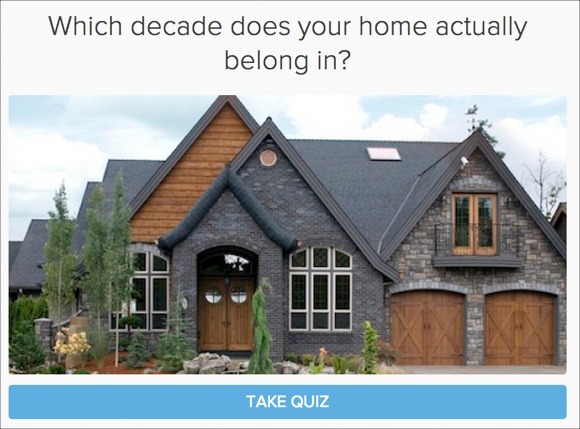 Set up a quiz and gate a user's answers via a squeeze page. Once a user has already invested time into completing a quiz, the chances are they’ll be more likely to provide an email in order to access the answers. Here’s an example from a website that specializes in home renovation. 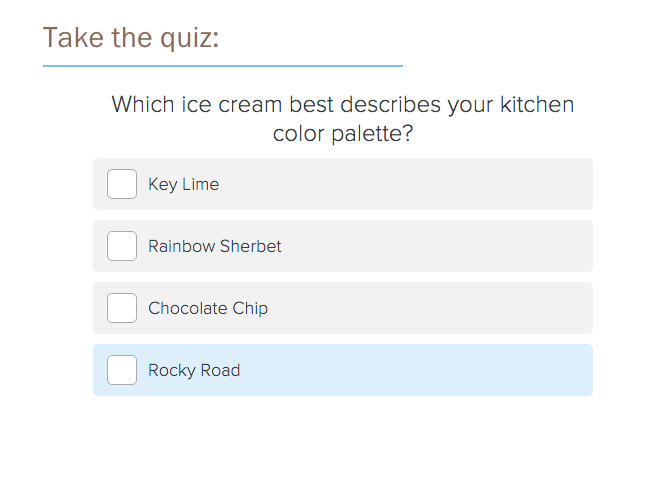 Notice how playful and light this quiz is. 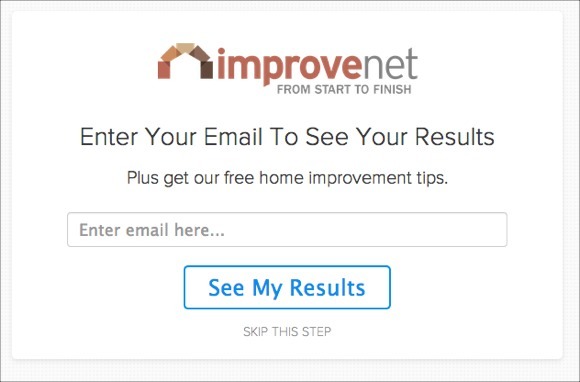 At the same time, after a user completes the quiz they are prompted with the option to get their results as well as some home improvement tips. Giving away a coupon is a great strategy for two reasons. Firstly it gives you a target email list of people you know are interested in your specific product. And secondly, it’s a great tool that can be used to drive sales. 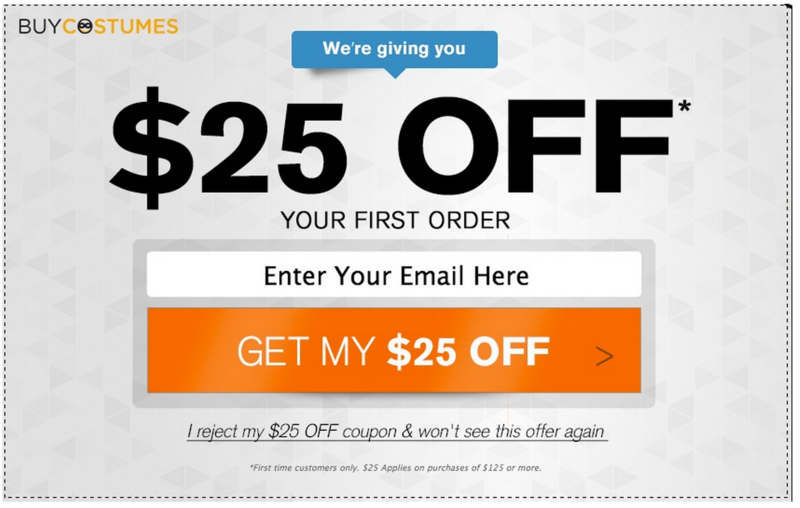 Here’s an example of a simple e commerce coupon that offers $25 off a user's first order. To create your own coupon giveaway, check out our online promotion platform. Give people access to video content such as recorded conferences, talks, and over events. This is great for compiling a list of prospective attendees for future events and building up a mailing list for specific types of content. 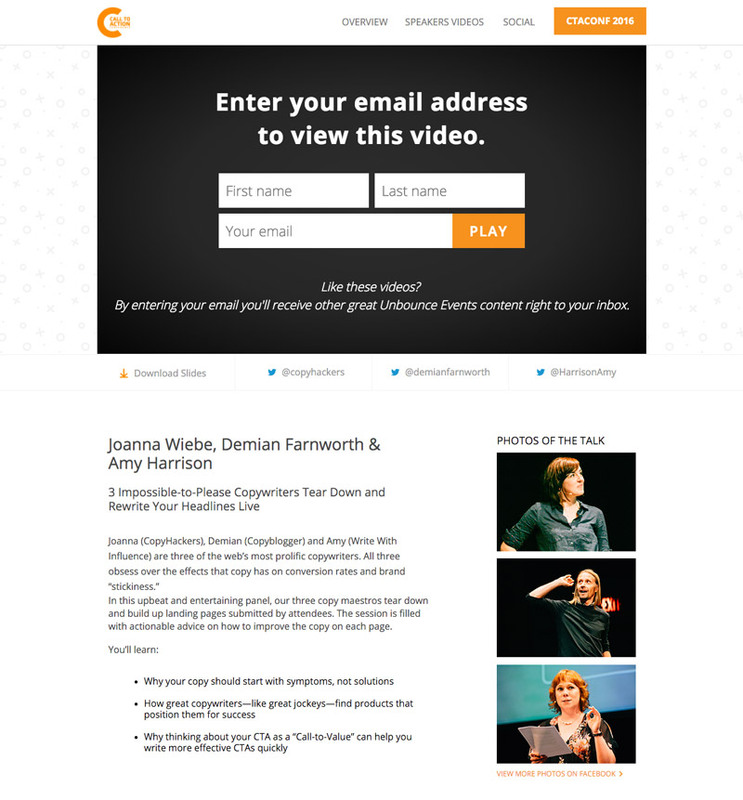 Here’s an example of a video recording of a speaker from the Call to Action marketing conference. In this example, conference organizers used Wistia turnstile to gate the video after a minute and a half in order to give viewers a taste of what the talk was about. By getting users invested in the content, they’re much more likely to fill out the form in order to continue. Use case studies to show your prospective customers how other people similar to them were able to solve a specific problem. Case studies are a great lead magnet since they indicate a user is aware of a problem and is actively seeking out a solution. 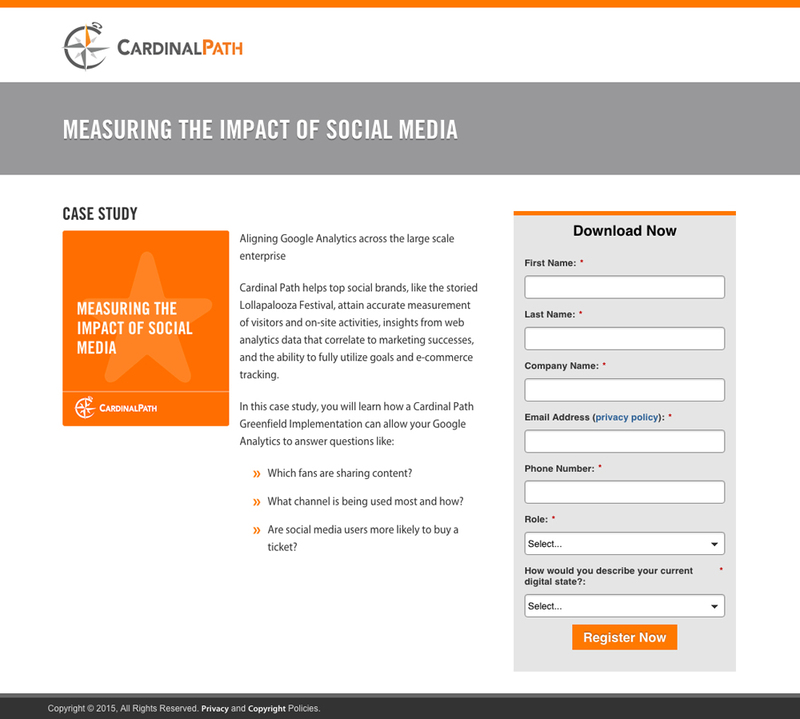 Here is an example of a case study by Cardinal Path that breaks down some of the different ways companies have been using their services. People love free stuff, period. And the only thing better than a virtual freebee is a physical one. Make some branded content such as t-shirts, mugs, and water bottles and give them away when people sign up for your product or service. Here’s an example from New Relic, an analytics company that has given away more than 750,000 t-shirts in the past 3 years. 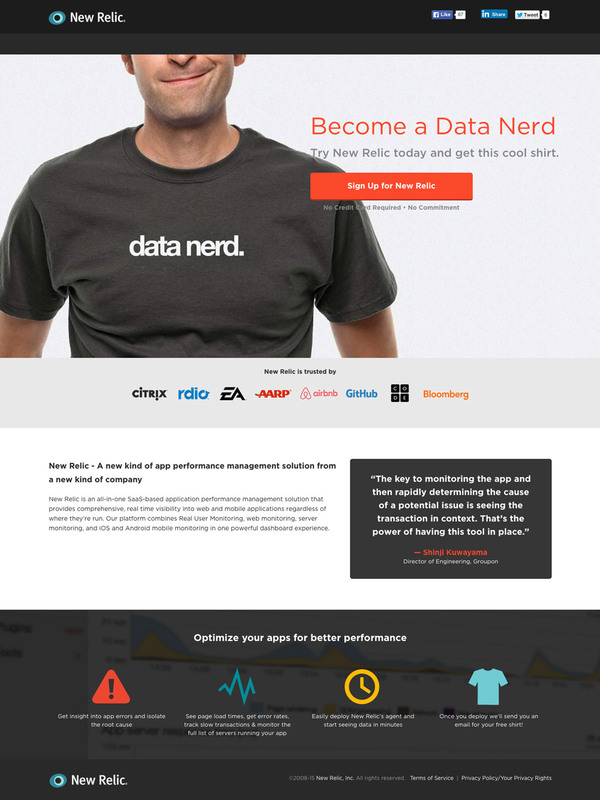 Notice how the shirts themselves fit the persona of New Relic’s ideal customer? Techy, analytical and nerdy. New Relic knows the cost of a t-shirt is nothing compared to the lifetime value of a new customer. Crunch the numbers and see how realistic sending out swag is for your business. Chances are it’s more affordable than you think. 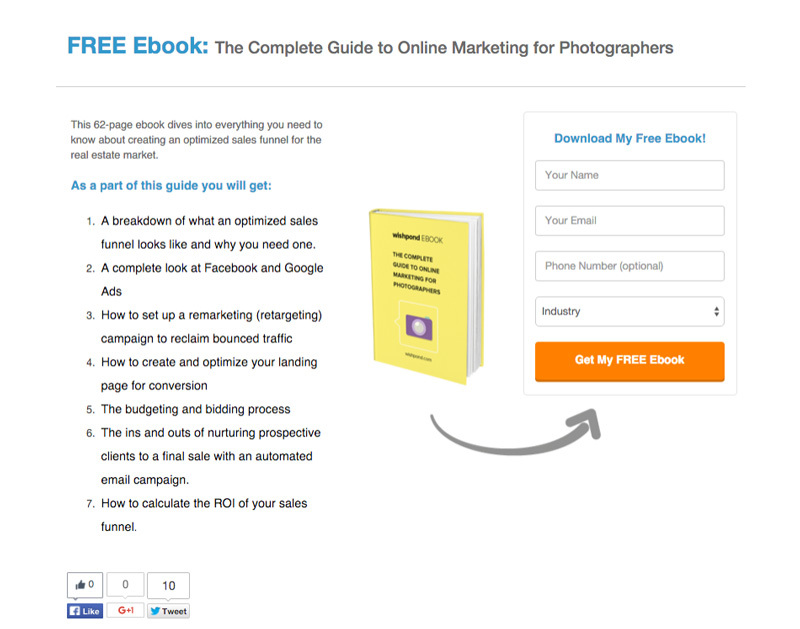 An ebook is one of the most tried and true lead magnets on the market. A simple way of positioning your company as an expert in your field, ebooks can be any length and can contain information already available on your website or blog. By taking general information on online marketing and tailoring it specifically to photographers, we are able to create a lead magnet that is much more useful to members of the photography community. When creating your own ebook, remember to keep it as focused as possible. Try and serve just a single niche, but serve it well. For more on creating, designing and promoting your ebook, check out my colleague James’ article “The Ebook Design Kit for Marketers Who Can’t Design for S**t”. There you have it, 9 lead magnet ideas to spark your imagination. Creating a lead magnet doesn't have to be hard, and the length of your lead magnet doesn't always matter. If you’re short on time try creating a checklist or a coupon to start. You can also consider repurposing some of your previous content into courses or guides targeted at a specific niche. Whatever you choose though, remember to keep it specific and useful. A user should be able to download you lead magnet and within 5 minutes start to realize some value. That’s what will have them coming back for more.